The Chansel House has an awesome view of the mountains from the back porch! Arrowmont Stables & Cabins is a 200 acre working horse farm located on top of Cullowhee Mountain at 4200 feet elevation. We best serve families who are looking to get away from the stress of city life and want a remote, quiet place to relax... and the horses add their own special charms. 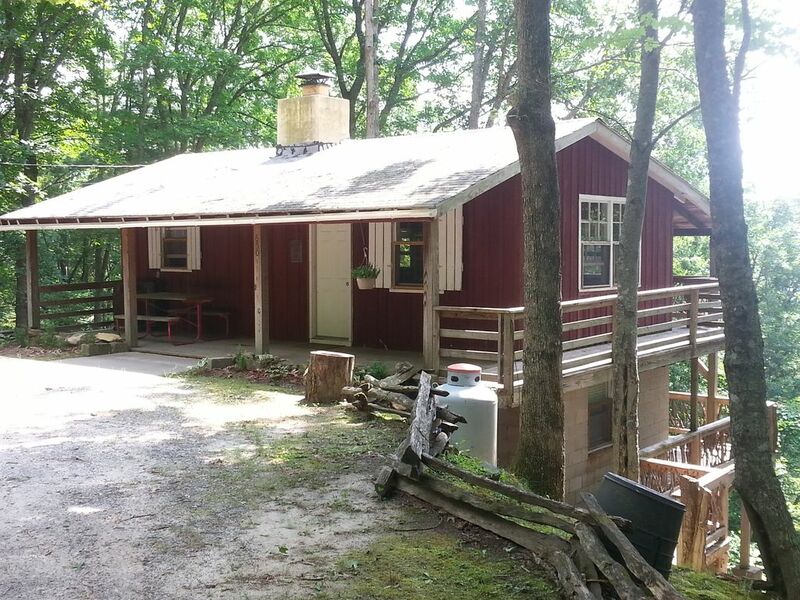 For your stay you enjoy a simple and comfortable mountain cabin with a fireplace, 2 bedrooms/1 bath, living room & kitchen. The kitchen is equipped with dishes, pots/pans, stove, refrigerator, toaster, coffee maker and microwave. Linens and towels are provided for the bed and bath. All you need to bring are your food and clothes... and maybe a chef so you don't have to cook. Or, you may enjoy some of the great restaurants in the area. Some cabins have great views of mountains in the distance & some are surrounded by a beautiful forest with great views of the horses and riders passing by. If a relaxed, laid back vacation is what you're looking for, you've found it here. Your driveway is a mile long bumpy gravel road to serve all the cabins. Your horseback riding program is one of the best in the SE, maybe even the country. You experience majestic trails with 30 mile views from the top of the mountain, a valley with creeks, streams and a small lake, plus, lush fern forests. Truly, these are breathtakingly beautiful trails for you and your family to enjoy. For the more adventurous we also provide Primitive Campsites (no electricity). The Fort is a rustic old lodge perfect for creating a friendly and inviting atmosphere for your special event or banquet. In the reception area there is a small stage and a large rock fireplace with six foot openings on two sides so you can enjoy the fire from the dining room as well as the reception area. The dining room has some charming genuine gas lights to light the night. You can have up to 150 guests in this quaint old lodge for a fun-filled event. You have access to 200 acres at 4000 feet elevation. Arrowmont is a working horse farm with majestic views & great trails. In the valley enjoy fishing in a small lake stocked with Rainbow Trout. You might even see some wild turkey or a family of deer. Then there's the possibility of finding some garnets, rubies or sapphires while you are hiking on the farm. or… Hike to nearby Hatcher Falls, only a mile away is the highest lake east of the Mississippi River (you'll think you're in Lucerne Switzerland when you see it!) or visit Whitewater Falls - the highest cascading falls in the east, plus much more! This is "God's country" and His "land of waterfalls" is filled with breathtaking beauty and inescapable majesty. Be prepared to stay a while... the mountain splendor and morning mist captures your imagination! There's so much natural beauty here it's inescapable and you won't be able to leave. Arrowmont opened in 1960 as a private boys camp. We operated as a private youth camp for 17 years. Our camp was written up in Woman's Day magazine for the program it offered. The boys actually learned how to take of themselves in the woods and took adventure hiking trips on the Appalachian Trail. After taking a few years off for some well deserved rest, we chose to open our doors to the public in 1983 for horseback riding and vacation cabins. Since providing a learning experience in an adventurous atmosphere worked so well for our campers, we wanted to carry on this philosophy with you... to share the best of learning, having fun and family adventure with you as well. Arrowmont Stables offers some of the best trails and services in the SE, maybe even the country! The trails vary from majestic mountain tops with 30 mile views out to the Blue Ridge Parkway to a picturesque valley with creeks, streams and a small lake to cool deep wood fern forests with lush greenery. . The personal attention given to introduce you to riding and trying your horse out is hard to beat. The horses are allowed to roam freely on the 200 acre farm after work so you may have some 4 legged visitors stop by to see you at your cabin. Or you may watch them mozy past on their way to their evening pasture. Now if you're a die hard city person who has to be 5 minutes from a convenience store, this is not the place to be. The grocery store is a 30 minute drive. But you are only a mile away from the highest lake east of the Mississippi River, Lake Glenville. A beautiful, pristine lake that will remind you of a lake in Lucerne, Switzerland. But if you enjoy the outdoors and looking for a little adventure, you've come to the right place. We are a little piece of heaven away from the horns and lights of the city. God truly outdid Himself in these majestic mountains and that's saying something! Leave your video games, cell phones and shopping malls at home. You come here for other reasons, like being in the middle of the "Land of Waterfalls", over 40 free or nearly free things to enjoy with nature and history, gem hunting and, of course, horseback riding. Simple but complete bath with tub and shower. We are a 200 acre working horse farm on top of a mountain. The closest town is Cashiers NC, 10 miles away. Because we are at 4000 feet elevation, its hard to escape the beauty and majesty of these Smoky Mountains. It's everywhere you turn. covered porch off the living room and a second covered porch off the King bed bedroom. We are located at 4000 feet elevation on top of Cullowhee Mountain near Lake Glenville and Cashiers, NC in the south and Western Carolina University in the north. There are a mountain of outdoor, adventure oriented activities to do here. Don't count on your cell phone or GPS to work. This is really a back to nature experience and you can actually see the stars at night. In fact, we were in an excellent location to view the solar eclipse. Wish you could have joined us. Because we are on top of a mountain, there is a two lane, twisty mountain road to get to us. When planning your mountain trekking, save twice as much time as on the highway to arrive at your destination. You will think surely you've driven 10 miles when it's really only 5. Two weeks notice minimum required for cancellation with a refund. Less than two weeks cancellation notice requires full payment. Also, late arrivals or early departures are not grounds for refund.